THE HORROR TREE: Slaughterville - A Card-game of Fun and Horror! 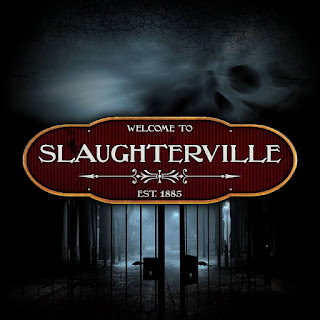 Slaughterville - A Card-game of Fun and Horror! As the The Horror Tree, we LOVE horror and games. Also Board-games and Card-games! This month a really special card-game has been released on Kickstarter! A card game that takes you to a town full of horrors! 'Slaughterville' takes you on a journey through a town that just happens to be host to numerous supernatural and horrific phenomena. Will you defeat the villain, or become yet another hapless victim? Abandon all hope, ye who enter Slaughterville! During the game, you play the role of one of Slaughterville's citizens. Each one of these citizens has a special ability that can help you save the day. During your turn, you must visit one of the six locations in play. Each location has a deck of 24 cards. These cards are used to determine what happens to you as you try to defeat the villain and save the day. A multi-player game is completely cooperative unless… well… We'll just leave it at that. It's better to not think about such things. The kickstarter has been a succes the very first day! But it has many stretch goals to be unlocked! And that is only possible by backers! For only $40,00 you will get 700+ cards if every stretch goal has been succeeded! Will you buy a ticket and visit Slaughterville?